Setaregan Hotel Shiraz which is located in the northern part of the city with a beautiful view of the city during daytime or at night, welcomes the guests who want to relax in a calm atmosphere far from tensions of the city. The hotel also offers tours of Persepolis, botanical garden, old and new part of the city of shiraz and historical monuments. 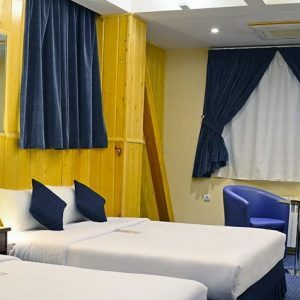 Other facilities of the hotel, include Sauna, Jacuzzi, Laundry, Coffee shop, Taxi service, Traditional and modern restaurant and equipped saloons with heating and cooling systems for different seasons and free high speed internet service (wireless). Setaregan hotel with its suitable facilities and special saloons is ready to host your family celebrations, seminars, anniversaries and cultural gatherings.